Ming Kee Shoes 明記皮鞋 , operated for over forty years hand-making leather footware at 30 Bowring Street, Jordan, until its closure in 2011. The owner, known as Uncle Ming, was forced to close due to a large increase in rent but also because his skilled workers were aging. However, Ming Kee’s wooden lasts, stitching machines and other tools were bought by an enterprising young couple, Kit Lee Ya-jing and her husband Jeff Wan Chung-sin, who launched Shoe Artistry in February 2012. They opened their workshop at 61 Tung Choi Street, Mongkok, with the help of some veteran shoemakers, all with thirty or more years of shoe making experience including Uncle Kwong, Uncle Ming’s brother. One effort to maintain touch with Hong Kong’s vanishing industrial skills. As Kit says “instead of always looking to China to get things made, why don’t we look at what Hong Kong has to offer”. 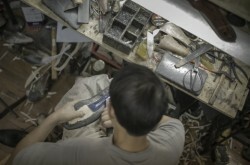 This article was first posted on 29th October 2013.
http://www.youtube.com/watch?v=5uLvBEUKUiI shows footage of Ming Kee Shoes (with English subtitles) and further information about Shoe Artistry.